I remember when oat bran muffins became all the rage as a health food in the late 1980s. Adding lots of oil or butter practically nullifies any benefits you would get from the oat bran, but they can be made healthier. This version uses skim milk and applesauce for binding liquids and ground flax seed as part of the dry ingredients. You can use pre-ground flaxseed meal or grind your own in a blender or coffee mill, just make sure the coffee mill is dedicated to grinding spices and grains. Either way, keep the flaxseed in the refrigerator or freezer as it can go bad rather quickly. These aren’t delicate, fluffy muffins—they are substantial and have a hearty texture. I adapted this recipe from one on Bob’s Red Mill website. The recipe was already good, I just tweaked it a little bit. The nuts are called for in the original recipe, but I often skip them. My boys love these, so I make mini muffins because that is a perfect size for little hands. As soon as this batch was out of the oven, my boys started following me around and poking their fingers in the basket trying to snag one while I was photographing. I did finally manage to get a photo without any fingers in it, and then I handed one muffin to each of them. In a few seconds those were gone and the boys were asking for more. Adapted from a recipe at Bob’s Red Mill. In the large bowl, mix together flour, flax meal, oat bran, brown sugar, baking soda, baking powder, salt, and spices. In the small bowl, combine the milk, eggs, vanilla, and applesauce. Add to the dry ingredients and stir until just blended. Fold in the carrots, apples, and cranberries. Fill prepared muffin tins 2/3 full with batter. I can get about 48 mini muffins out of this recipe. These do freeze well and make a good snack or breakfast on the run. Warm a frozen muffn in the microwave for 15 to 30 seconds depending on the size of the muffin and the power of your microwave. I just made a batch of these muffins. 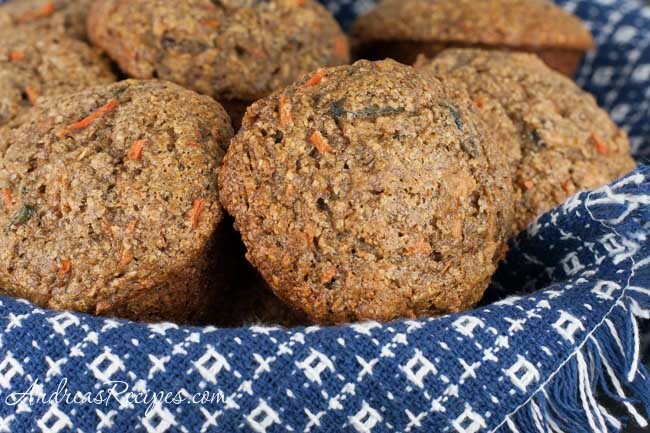 They are delicious and one of the best muffins I’ve made or eaten in a long time! Great! I’m so glad that you liked them. I love these too, but cannot find the carb count on them. I have lost weight on a lower carb diet, and would love to know the carb count on these! Hi Pam. I’m sorry, I don’t currently have a way to automatically calculate that information for each recipe.